I'm studying up for the trip. Any places for great antiques and shopping along the way? Things we must see? We've gone to some fun places around Houston, but would love to hear about new places we haven't been. Country Home and Country Living have been teasing us with Texas antiques for years, now that we have the time and the transportation, we'd like to see them. I notice our timing is completely off for Round Top or Canton Trade Days. Anyway, it's sewing time as usual. Hope you guys had a fun weekend. I'm hoping you guys go to places that boast the biggest ball of yarn, the alligator woman, a visit to a diner in the middle of no where, a tumbleweed, at least one trip for 2 for 99¢ JITB tacos, an ice tea in a glass shaped like a cowboy boot and any store that boasts an item "the size of Texas". And plenty of stops at Dutch Bros. coffee... lots of them in AZ. Trust me, you will love them. Order the "Monica's Dutch Mafia Special". They will pretend they don't know what that is - but just play along, k. It's a 20 oz. Americano with 3 shots and heated half n half. And ask for stickers at each one! Have E. put in Dutch Bros on her iphone map... and your car will magically go to one. Leigh Ann and I are driving too. But... from Michigan. I haven't had a pedal to the metal road trip in a while. I am up for the adventure. I'm afraid we will run out of things to gossip about. See you in Houston. Oh, you guys are going to have a blast! When do you go? 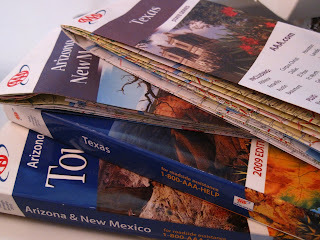 Are you going to have time in Albuquerque or New Mexico in general? Give us your route, we'll hook you up. I've made that trip many, many times. Lots of fun, fun things to see & do. Du'h I found your route. You best be showing us cowboys in chaps. Chaps I say-that's all I want to see. Front and back views please. I can't wait to see the places you will stop. But I remember you blogging about some of the great eats and treats around Houston last year, those I am really interested in. We have given ourselves a little more time this year and might like to venture out to see them. Would you mind e-mailing with with the info? Only if it isn't too much trouble. I will be sure to thank you in person when I see you in Houston! Can't wait! Awwww... you're not going anywhere near Dallas. Pooh. Well, of course you'll go right near Fredericksburg, so I would have chosen that route, too! San Antonio is of course gorgeous, you have to visit the Riverwalk while you're there. Have fun, I can't wait to read about your exploits! In Spring, Texas, just outside of Houston, is an awesome little fabric shop that (I swear) has almost every line of Moda fabric. I am amazed at the stock every time I go there. GRS Creations, I believe is the name. Old Town Spring is a great little shopping, antiquing areas. Ya'll are going to have so much fun. Yes I am from Texas. Too bad your timing is off for Round Top and Canton. I will be in Round Top this weekend and can't wait. Canton is fun too. Both have way more "junk" than you can see in one day. Be careful and have fun! If you are coming to TX on I 35S, stop in Salado (south of Waco), and eat at the Stagecoach Inn. It was a stagecoach stop in the 1800's and has wonderful food. There is also a good quilt shop in town. Fredericksburg is a fun town with a great bakery, Dietz, if you get there before everything is sold out. This German town has lots of interesting shops. Have fun in TX. We are proud of our state! you've got to stop in Spring, TX! It is about an hour north-ish of Houston. When I visit my mom (who is in Houston)I love going to downtown Spring. Some GREAT antiques...lots of shops. The BBQ is pretty good too!